This study is consistently praised, year after year, as a "must have" tool for analyzing pricing in the mailing services industry! 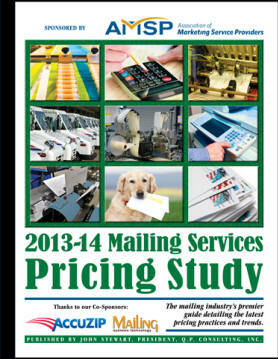 "It is difficult to get competitive pricing on mailing services. This survey provides us with the information we need to price our work properly." "I have been using this report for about 10 years and it has helped me greatly to make sure I am competitive and on track with my business." "Survey was thorough and market baskets helped identify pricing scenarios for which we could justify pricing increases we knew - We knew our pricing was too low in some areas of production." This valuable, just-released 124+ page report contains detailed pricing information on more than 45 key services provided in the mailing services industry. Plus, this year we provide you not only with national breakouts, but pricing based upon three different categories of firms - All Firms, Small Firms (those with mailing volume less than 100,000 pieces per month, and Large Firms with mail volumes of 500,000 or more pieces per month. Please note this study is now available for sale, and orders can be placed immediately by using the Order Line Offered below. Remember, this study is offered on a 100% Money-Back Guarantee!